SARASOTA, Fla., April 17, 2018	(Newswire.com) - Pathways Treatment and Recovery Center is pleased to announce a new, updated website. The site is the first strategic action we are taking in a strong push to change the way recovery centers are perceived in the state of Florida. “Although Florida has been under the microscope for having unethical rehabilitation centers, that doesn’t change the fact that we are in the midst of a true crisis in our state. Pathways has been treating substance abuse for more than 30 years with the highest standards of care and will continue to do so. Our new website is the first of many efforts to increase our visibility to those in Florida and across the country that need help in recovering from a substance abuse disorder. Pathways is a highly regarded rehab facility with a proven track record, we offer hope and support to all who enter our recovery community,” said Casey Collier, VP of Residential Services. At Pathways Treatment and Recovery Center, a Florida Rehab Center, we believe in trying to understand our clients’ specific needs and tailor our treatment programs specific to them. Our professional staff interacts closely and compassionately with clients to establish the underlying cause and extent of their addiction. We believe that the right treatment makes all the difference in the recovery process. We offer treatment for addiction to alcohol, cocaine, heroin, opioids and other drugs. Our treatment strategies also involve our clients loved ones. Family and friends are required to participate in support groups and treatment meetings to express how their loved one’s addiction effects them. This also allows friends and family members to learn more about drug addiction and the tools that are needed for effective communication. We provide a place to learn how to understand each other in a safe and non-judgmental environment. 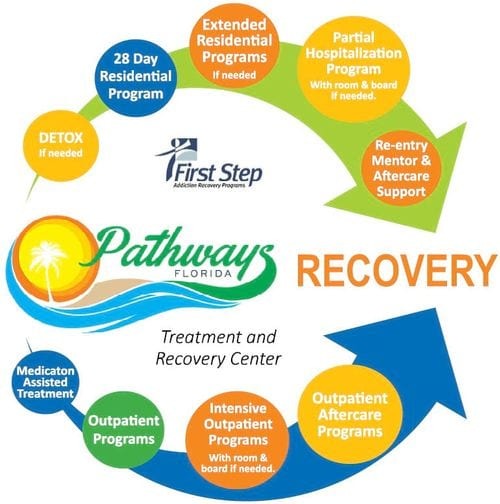 Additionally, Pathways Treatment and Recovery Center is a results-oriented, 12-Step recovery treatment program which uses proven, science-based methods for treating substance abuse disorders. From the beginning days of detoxification, through the weeks and months of the recovery process, many people find the road to a new and better life. In addition to our renowned residential treatment programs that lend their name to the Pathways Florida Treatment and Recovery Center, we’ve broadened the treatment options available to clients through additional treatment modalities. Because commercial health insurance companies sometimes have strict guidelines about the types of treatment and lengths of stay they will cover, services such as our Intensive Outpatient Programs (IOPs) and Partial Hospitalization Programs (PHPs) open up greater access to the necessary care and treatment for addiction. In addition to our brand new website, significant upgrades to our campus are underway. Pathways Florida Treatment and Recovery Center is becoming an even more beautiful, comfortable, and secure place to seek assistance and support in recovery. Pathways provides affordable and highly effective treatment program and is licensed by the State of Florida and accredited by the Commission on Accreditation of Rehabilitation Facilities (CARF). We are located in the state of Florida with our treatment center in North Sarasota, near the Ringling Museum and Marie Selby Botanical Gardens. We have 70 furnished bedrooms that allow for two clients per room. Each room has its own bathroom and closet. For the comfort of our clients, we have a volleyball court, an exercise area, a state of the art kitchen that serves three healthy and dietician-approved meals daily and a swimming pool. We provide specialized 12-Step meetings and many other support groups for our clients, based on needs. 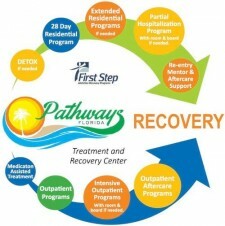 Pathways Treatment and Recovery Center is a First Step of Sarasota, Inc. program. First Step is a 501 (c)(3) nonprofit organization licensed by the State of Florida and accredited by CARF. For more information, visit www.pathwaysfl.org or call 855-256-6136.